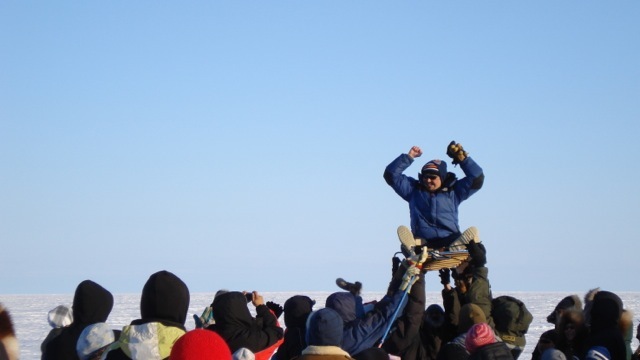 The winner of the 2008 Qavvavik sled dog races in Gjoa Haven, Nunavut, supported by the community in an inhospitable environment. A thought about the rank of self within the higher order of the universe: I am a small, insignificant part of a much larger organism. Despite that smallness, the self is assigned a significance of its own because it is at the same time a manifestation of the whole; also because it bears its own potential within. That potential is a substantial part of the larger organism, without which the whole would not be complete. I believe this thinking is influenced by the thought of Mahatma Gandhi. The fundamental premise of individualism is that the human individual is of primary importance. I can see in the world around me how that worldview has given rise to self-importance that borders on solipsism. Self seems to have become the ultimate reference point. The significance of self and the individual eventually was enshrined in the Universal Declaration of Human Rights and the Canadian Charter of Rights and Freedoms. This is in stark contrast to Gandhi’s wisdom, where he says that he must reduce himself to zero out of his own free will in order to achieve any standing among his fellow creatures and to experience salvation (from chapter 168 of An Autobiography: Or the Story of My Experiments with Truth). Nowhere in Gandhi’s work do I sense that he denies each human being an individuality, but he seems to understand that this individual manifestation is simply a part of something much larger. By reducing one’s self to zero, which I understand as living in ultimate humility and in accordance to divine will, each human being will be able to unfold his or her fullest potential and contribute to the common good. Whatever you do may seem insignificant to you, but it is most important that you do it. Because nobody else will. Because I understand the universe – creation – as an organism, every single particle or cell is necessary for the completeness and full functioning of the whole. I am aware that this can be seen as mechanistic (that we would be part of a machine, and that the machine would not run without that part). However, my understanding goes much beyond: In a machine, if one part quits, the machine as a whole may have difficulty running or may cease to operate. The universe can easily exist without me. It has so before my birth, and will continue to do so after my death. But while I am here, it is significant that I unfold my potential and contribute to the common good, that I experience life in kairos, and not just in chronos! Furthermore, I am a unique human being, one among many, but not simply replaceable. Therefore, I need to contribute everything I do, no matter how insignificant it seems: because nobody else will! It seems to be this mystical experience that reveals the universal source of human identity. It is the recognition of that spiritual reality that gives me guidance as well as assurance that I am insignificant but nonetheless essential in and for the universe.